← High Atop Tater . . .
What I’ve Learned . . . . .
As October 14th came and went, I realized that I’d been at my new job for two whole years, and that at some point I was going to have to quit calling it my new job. It gave me a moment of pause to think about all the things I’ve learned since landing in Boone two years ago. 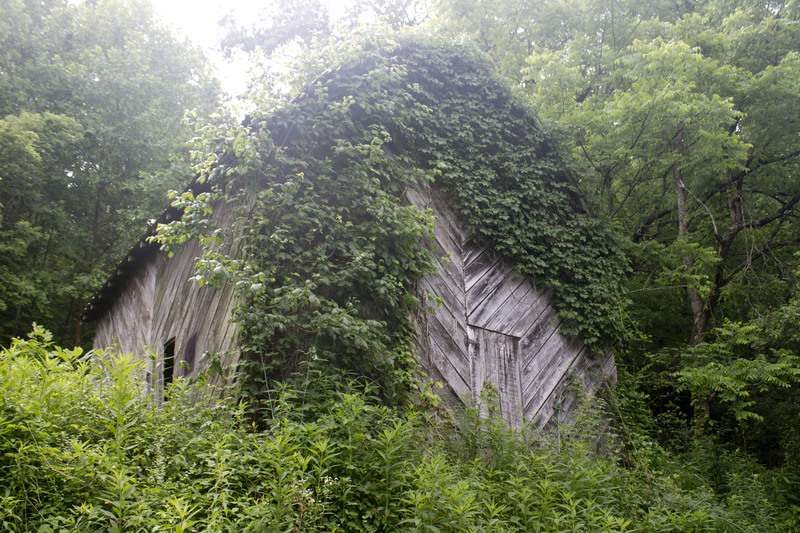 An old barn on our road (we have lots of old barns. I think there’s a county ordinance against tearing them down). Some background and a reminder before I list my new knowledge. 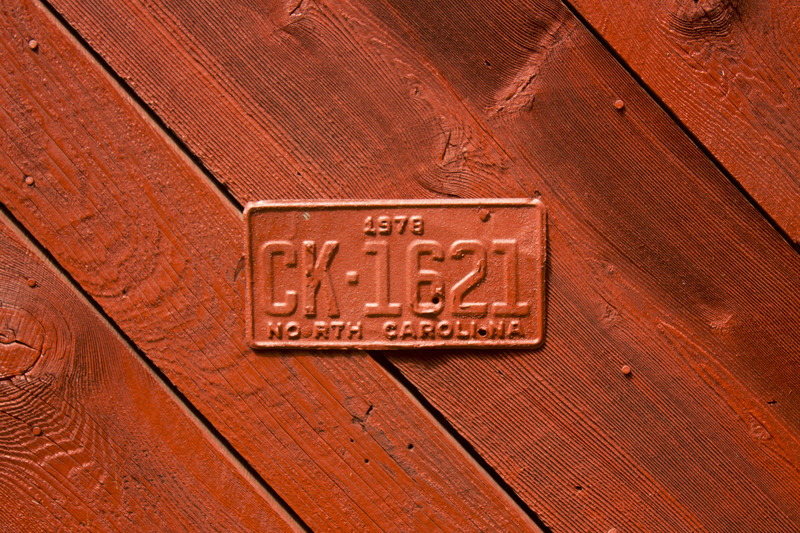 Boone is in the western mountains in North Carolina. While it’s likely that we have just as much humidity as the rest of the state, the mild summer temperatures mean that we just don’t feel it. The house we’re in right now doesn’t even have AC, and so far we’ve not missed it. So it’s easy to forget that the humidity’s there, except when you get the occasional reminder. . . . I have curly hair (now that I’ve figured out how to keep it from falling out). Not Shelley McGrath curly (which I wouldn’t mind at all! ), but more curly than straight. Everyone always wants the hair they don’t have, and I got it! Corn steams. And not corn fresh out of the microwave. Corn planted, in the field. Steaming away. Moist seal envelopes will seal themselves. Don’t buy them, get the self-adhesive ones. And if you get a return envelope that you plan to use, you’d best fill out what’s needed and send it out. Otherwise you’re going in search of another envelope. Power poles steam. Not even kidding. Fall leaf season and a great hairdo have a lot in common. A little rain or a good wind, and it’s all over. So now we find ourselves preparing for our third winter in the mountains, and all the ‘grey beards’ have been predicting that it’s going to be doozy. Fuel oil is full, propane has been refilled, and three cords of wood sit stacked by the garage. But it goes unused as of right now we’re engaged in a vicious game of Chimney Chicken. As the warm weather folks on the block, we CAN NOT be the first to light up our wood stove. CAN NOT. So we’ve been carefully monitoring all the neighbors’ chimneys so we know when we can give in and start our winter heat. I don’t think they realize they’re playing Chimney Chicken, but so far they are dang good at it. But I’m competitive. I’ll be an ice block before I lose a game that exists only in my head. And now, here it is, your Moment of Zen . 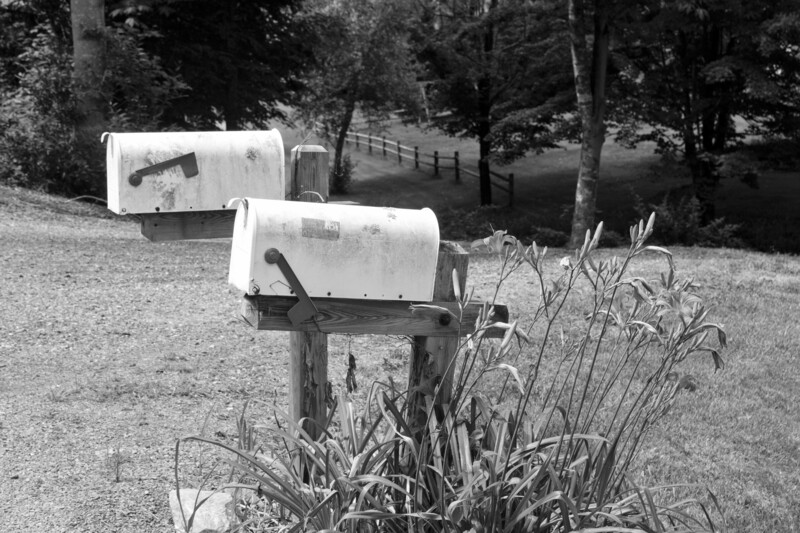 . . . .
Our mailbox, all artsy and stuff. This is on a barn in our neighborhood. Good to know barns are street legal. 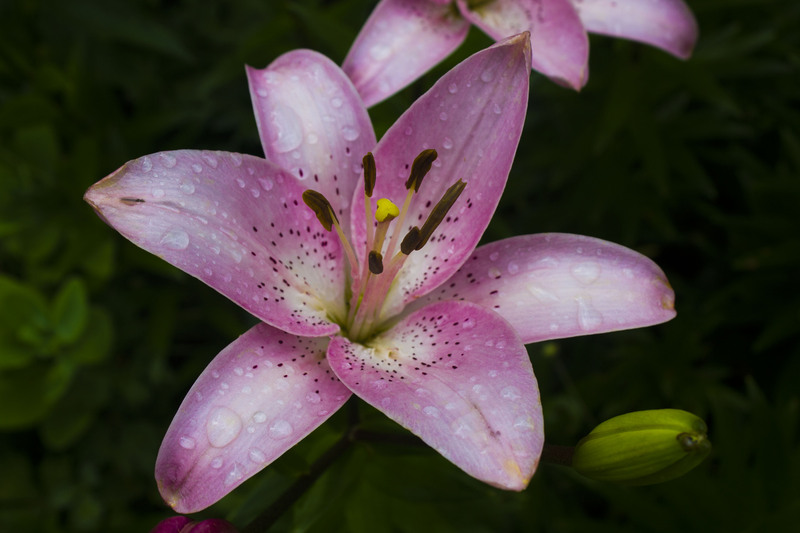 You know I can’t pass up flowers after the rain…. 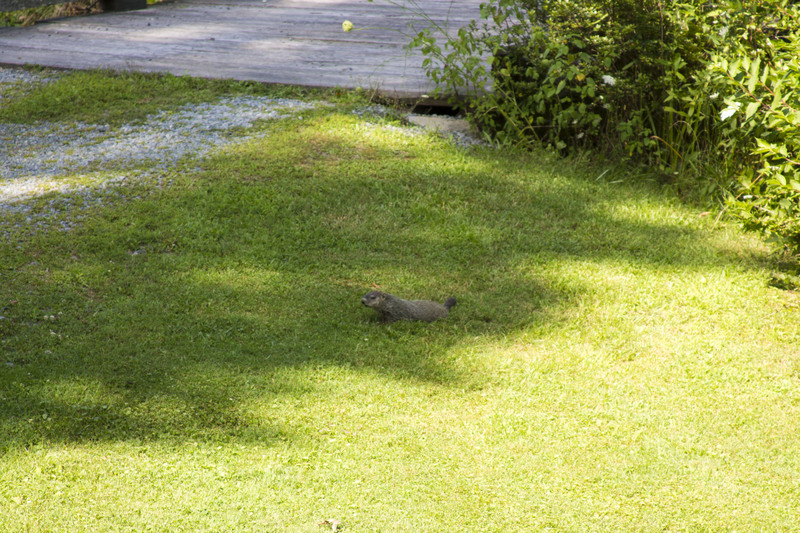 We have a groundhog/woodchuck/fat rodent family under the bridge in our driveway. I think they’re cute! 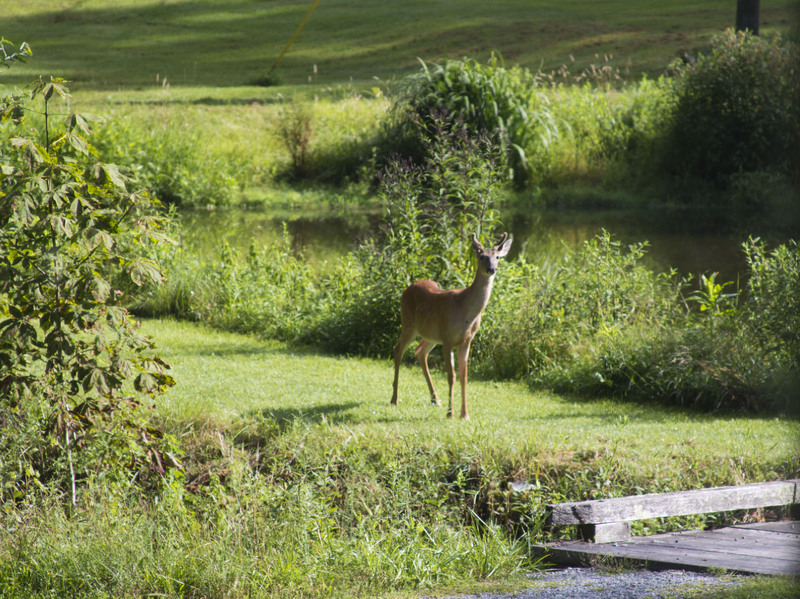 A young deer this summer, coming to get a drink in the pond. I hope everyone is well, and preparing to enjoy their mild Arizona winter. I’ll keep you abreast on if the grey beards are right, or if they just like tormenting the non-natives.